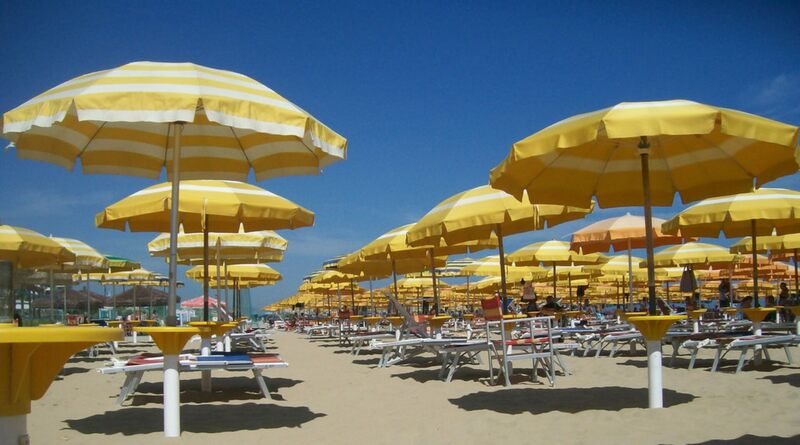 One of the first places I was taken to when I first visited Italy was the beach. The Pescarese are besotted by their wide sandy beach and happily spend summer days stretched out on the sand absorbing the Mediterranean sun to get the perfect tan. After observing the beach for a while I realise that lying in the sun close to the sea, only expending enough energy to breathe is the Italian national summer sport. There are quite a few ways to do as little as possible, many of them requiring the display of style and panache. Supposedly Italians have mastered the art of making the difficult look effortless. On the beach I suspect they have mastered the art of making the very simple appear difficult and extremely hard to do. This is what I mean. I’m on the beach in Pescara walking through the shallows enjoying the warm water and the sun. Just where the sea meets the sand there is a woman stretched out on a beach lounge she has dragged to the water’s edge. She is presenting herself for the whole of Pescara to gaze upon in wonder. She has taken a lot of time and effort to present an unforgettable sight. Draped along the lounge she is showing off one of the deepest bronze tans you have ever seen. It glows in the morning sun. Must have taken her all of summer so far to get it to this degree of perfection. Having grilled herself to coppery excellence she has also carefully considered the most effective way to highlight the best tan along the Adriatic by curating her beach wear. Curating once referred to putting together and caring for art exhibitions and museum collections but now is applied to more mundane situations. E.g. the chef has curated wild ingredients for the new menu at the Dandelion and Thistle. Or…. McKenzie curated the recycling before she pushed the bin out to the kerb. Continuing the metallic theme she has decided that gold is the color that best shows off burnished bronze skin. From the top. Gold sunglasses, gold bikini, gold sandals, gold beach bag. And all complimented by gold jewellery. I don’t have to tell you the colour of her cigarette case. Everyone wandering along the section of sand is confronted with this magnificent sight. Fantastic tan, brilliant fashion sense. Look closer and you will notice that the perfect tan is wrinkled and her face is not that of a young woman. This look has taken decades of practise, experiment and attention to detail. But this is not the most incredible beach look to be seen. Paola’s friend Gigliola has the best look. Here she is trying her best to walk with casual elegance across a pebble beach. Blonde hair, full make-up, sun glasses, shirt unbuttoned to show her bikini and on her feet a pair of plastic high heels especially designed for the beach. Keeping high standards is important even or perhaps especially, on the beach. All this gold reminds me that this is an aristocratic beach, or so we’ve been told. In Australia there are no aristocratic beaches unless a billionaire is illegally trying to fence off public seaside land for his exclusive use. Here there are beaches open to all but great swathes of sand are covered with umbrellas and lounges. These belong to the beach establishments with their bars, changing cabins, showers, tennis courts and other facilities built right on the beach. If you want an umbrella to shade out from the sun it has to be hired. As many Pescarese do for the whole summer. Every year. Sandra’s Zia does this each year. Her establishment of choice is Eriberto. She tells us that this is a very aristocratic beach. I wonder how this can be possible. It all seems egalitarian to me. Then I take a more careful view. The thatched umbrellas are an attempt to give Eriberto the romantic air of a South Seas island. This doesn’t convince me at all as behind us across via Lungomare Nord are apartment buildings and hotels which look nothing like Bora Bora. Just like a society based on an aristocracy the umbrellas are arranged in a hierarchy. The closer to the water, the bigger the umbrella. Beginning furthest from the shore are the small shades for the peasants, next bigger umbrellas for the barons, counts and dukes of the beach. Of course this ordered beach society depends on what you are prepared to pay to be on a patch of sand nearest the sea. From Zia’s umbrella to dipping toes into the Adriatic.